my life for a long time. I started dog training in 1976 as a hobby. and came to the conclusion, that conditioning the dogs is not the answer ... thanks to the greatest dog "understanders" like Cesar Millan, John Fisher, Monty Roberts, Jan Fennel and not to forget a very important Behaviourist Bruce Fogle I developed my understanding of the dog mind. I am devoted and dedicated to dogs. I make dog owners understand their closest friend. I live on the Costa Blanca since 1990 with my husband and our dogs. We have rescued and rehabilitated a number of dogs over the years. I help people to understand that their dog is never "bad". Any problems with your dog can be sorted out at any age. 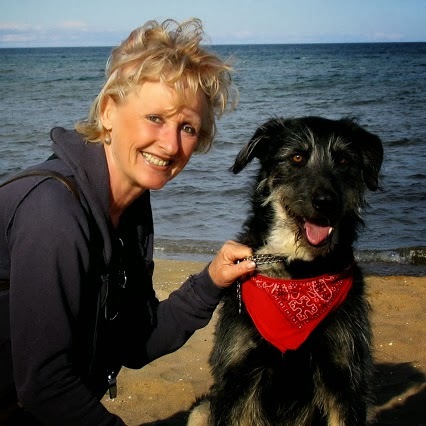 I am specialized in resocializing and rehabilitating dogs and train humans to understand and solve the problem. I started in September 2013 with publishing my articles about human-canine psychology to help dog owners understanding the dog mind and solving problems. In 2017 I was awarded my international Diploma as a Canine Behaviour Psychologist with distinction for my very special thesis and I am since then qualified to train people to be a Canine Behaviour Psychologist with an international Diploma as well. I am also there for You if You need help solving the problems with Your dog. Remember: "only a calm and submissive dog is obedient and happy !!! And a happy dog makes a happy owner !!!"